Last summer I taught in Guanajuato, Mexico for SOU’s MiM program. One MiM student from Ashland traveled to Mexico to take the class. The Mexican students got to thinking that they should do what that Ashland student did and take a MiM class in Ashland. So this summer most of my class from last summer came to Ashland and took a class. On their off day we went to Crater Lake. Yes, those are birds in cages in the windows upstairs. I could hear them from across a wide and busy street. It was only when I looked for where the sound was coming from that I saw the bearded man. I first visited El Gallo Pitagorico about 10 years ago. I don’t remember the food on that evening, only the view and the chairs. The ownership recently changed, and we had the good fortune to talk to the new owner. She speaks English, is very nice, and she is making El Gallo Pitagorico even better. She told us she had to let some workers go because they weren’t that good at what they do. I saw her training the employees to be perfectionists. Our food was very good. After dinner, the new owner said we could go upstairs and watch the sunset from their future bar. The bar is far from finished at this point, but El Gallo Pitagorico will only get better. Easy to find, look for the blue restaurant on the hillside when you are at the Don Quixote statue on the side of the Hotel San Diego. Today’s photo come from a little stretch of Guanajuato famous for its part in the history of Mexican Independence. I was in Guanajuato on September 28 about 10 years ago. That was a crazy celebration. 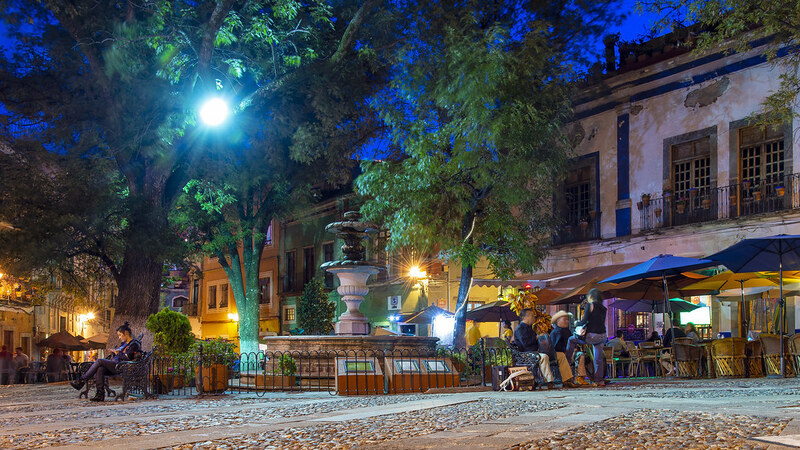 Ashland and Guanajuato share a lot of things in common–art community, university town, valley nestled in mountains, large tourism industry, etc. One thing Guanajuato has that Ashland doesn’t (does any place other than Guanajuato have this?) are the underground roads. Guanajuato’s tunnels sometimes have daylight overhead like the portion of the road in today’s photo. The tunnels were originally put in place to reduce flooding and a river of water (and sewage) ran through it until 50 years ago. A dam was then built and the previous water channel was converted into a road for vehicles and pedestrians. My first night in Guanajuato and I hadn’t eaten much all day. They don’t serve food on airplanes any more, and I even slept through the drink and nuts they sometimes provide. So I wasn’t going to last long walking the streets of Guanajuato on an empty stomach. I saw the Pirates and Marlins on TV, rain began to fall again, and my decision to eat at this place was decided. I don’t speak Spanish. My waiter didn’t speak English. Guanajuato style enchiladas sounded good. I ordered an Indio to go with it, thinking it may be an IPA. The waiter seemed to ask if I wanted tomatoes in my Indio. With that I changed my order to Sol. A chicken leg came with my enchiladas. Frescos on the walls were in a Van Gogh style, and the live music hit the spot. The rain came down so hard that the TVs stopped working. I waited until the rain weakened a bit and then headed back to my hotel. This is my fourth time staying in Guanajuato and each time I have lodged at this hotel. This was the first time I ascended to the very back of the property for this view though. Today’s photo is basically a reverse angle, taken a couple hours earlier, of yesterday’s photo.